I know, it’s been a while…but I’ve been away and just recently returned from a fantastic five weeks in Europe! Ok, not everything went smoothly, but still, I had such an amazing time I didn’t want to leave! It was weird coming back and not having to get up early to catch a bus or train, not having to plan where to go or what to see the next day…I kinda miss all that! Anyway, I’ll write more about my travels soon, but in the meantime, I wanted to share this simple, healthy and delicious recipe! 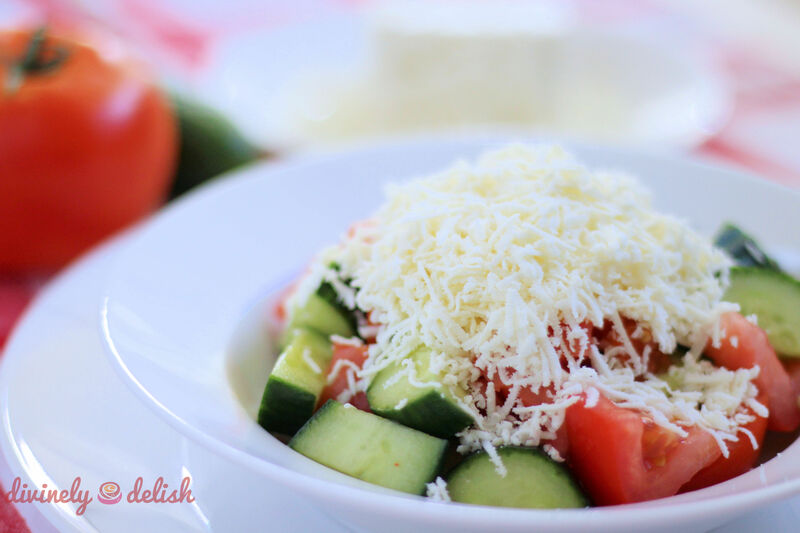 Shopska Salad (Shopska Salata) is the national salad of Macedonia, and that was where I tried it. Some of the other former Yugoslav countries, as well as Bulgaria, also lay claim to this salad. 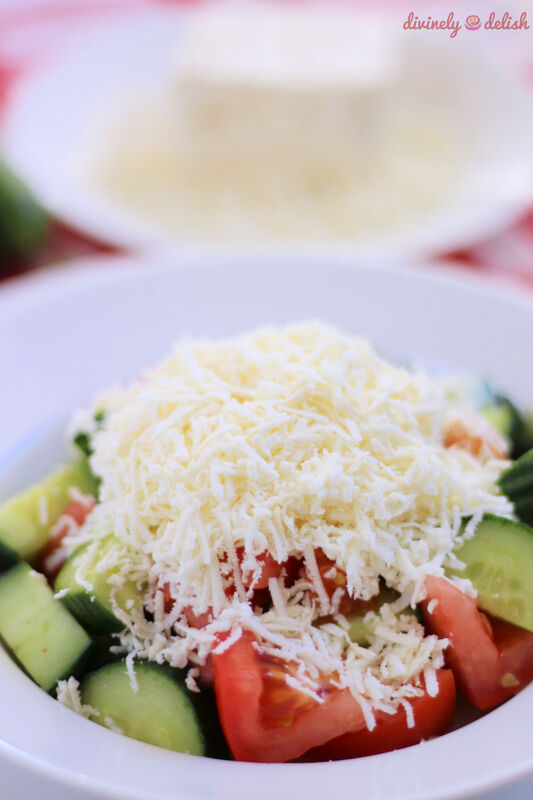 Greece, too, has a variation of this, and in fact, outside of the the Balkans, I think most people would probably just call this a Greek salad, minus the olives and with a lot more cheese! All I can say is, regardless of the origins, this is a really yummy salad! When I tried this at a restaurant in Skopje, I wasn’t expecting anything extraordinary. I mean, I’ve had lots of similar types of Greek salads with tomatoes, cucumbers and feta. But this was something else! Maybe it was the generous amount of cheese, or just the cheese itself. 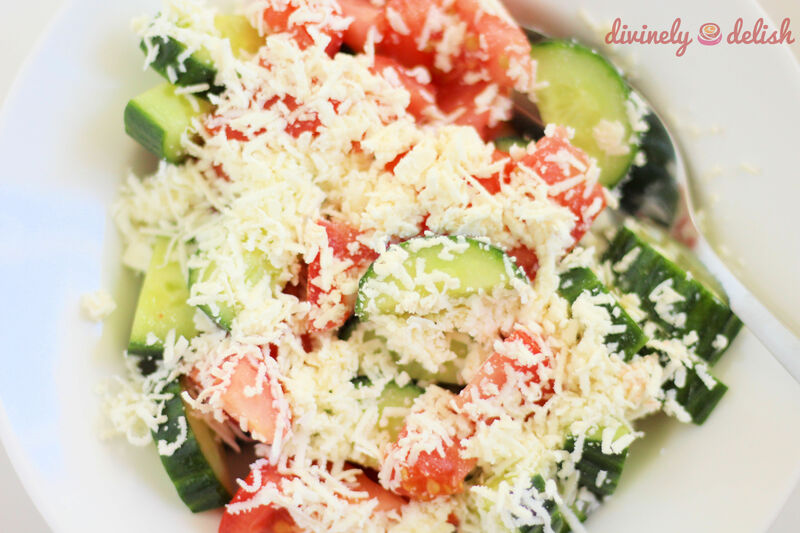 The combination of the sweetness and juiciness of the tomatoes, crisp and fresh cucumbers and slight saltiness of the cheese made this just the best tasting salad. And it’s perfectly refreshing too, especially in 35C weather! I later found out that the cheese they use is a white cheese called Sirene (or what is more commonly known here as Bulgarian feta). I wasn’t able to find this, so I used Greek feta, which is saltier and more crumbly, but was otherwise a pretty good substitute. There was really no need to to add salt. I didn’t even add that much olive oil either, and if using sirene, I imagine you wouldn’t even have to add any oil since the cheese already has more of a creamy texture (I’d describe it as sort of a cross between Greek feta and goats’ cheese). 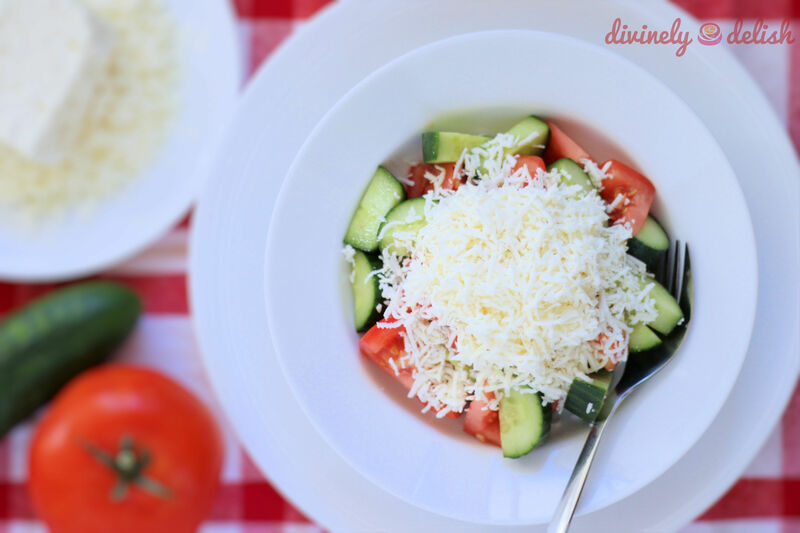 1) Dice the cucumber and tomatoes and place in a bowl. 2) Add salt, if using, and drizzle with olive oil. Gently toss to mix. 3) Top with grated cheese. Alternatively, transfer salad to individual serving plates and then top with grated cheese.